Confronted by a woman about his environmental record, Republican Sen. Rob Portman couldn’t get away fast enough. We’ve seen it before. Republican Senators and Representatives fleeing from their own constituents when confronted with questions they would rather not answer. Who can forget the time former Republican Congresswoman Michele Bachmann was captured on video fleeing the questions of CNN reporter Dana Bash back in March of 2013? Bash was questioning Bachmann about false claims she made regarding President Obama’s “lavish” lifestyle. Paul Ryan was met by angry protesters and hecklers who were chanting “Paul Ryan he’s the worst, he puts corporate interests first,” at a 2011 Labor Day parade in Janesville, Wisconsin, his home town. Ryan was captured on video condescendingly attempting to avoid their questions about jobs creation by offering them some candy. Republicans have found themselves unwelcome in their home states in recent months due to their efforts to repeal Obama’s signature health care bill the Affordable Care Act, otherwise known as Obamacare. Indeed, it has reached the point that several Republican Senators and Representatives are no longer hosting town hall meetings. Senator Rob Portman of Ohio is one such Republican who currently refuses to meet constituents in a town hall setting. This didn’t stop Meryl Neiman from confronting him about his environmental record at the Ohio State Fair in Columbus on Friday. Neiman, an entrepreneur and mother of two, confronted Portman about the Regulatory Accountability Act, which environmentalists say would thwart rules to protect public health and wildlife by making it easier for companies to hinder regulations in costly lawsuits. Neiman can be heard in the video asking Portman about what he thinks it means to someone like her who has concerns about what kind of world her children will grow up in as a result of that act. 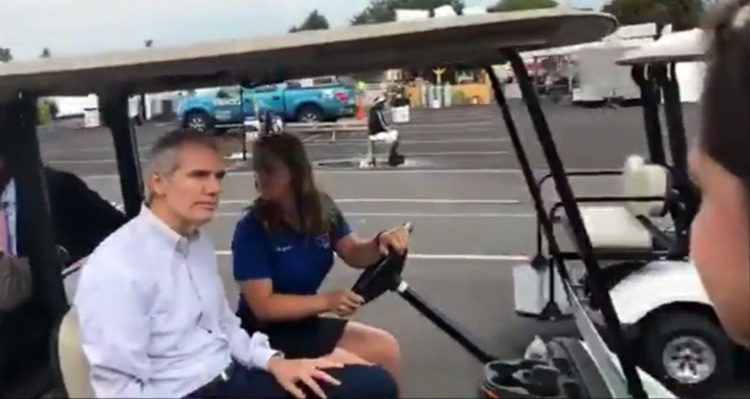 Portman can be seen grinning as his driver backs the golf cart away from the woman and speeds away.